The failure of peace talks and the end of South Sudan’s wet season could unleash fresh fighting between government forces and rebel factions, propelling millions of people in the world’s youngest nation back towards a man-made famine, analysts and humanitarian workers warn. Nine months of bad-tempered negotiations have yet to produce a firm ceasefire, let alone a political deal to end a conflict punctuated by atrocities. Skirmishes have continued in areas close to where thousands of civilians are crammed into UN bases. There are fears that both sides have used the seasonal lull to re-arm. Surging violence would roil plans by the UN and humanitarian partners to use the dry season to patch up roads and other infrastructure and pre-position critical supplies before the meagre returns from the current disrupted harvest run out in early 2015. The rains usually begin to ease by late October. The conflict erupted in December 2013, when an intensifying power struggle between President Salva Kiir and former vice-president Riek Machar boiled over into fighting within the Sudan People’s Liberation Army (SPLA) in the capital, Juba. Violence quickly engulfed much of the north and east of the country, pitting troops loyal to Kiir against rebel units and militias aligned with Machar. Thousands of civilians are believed to have died, many of them targeted for their ethnicity. Kiir is an ethnic Dinka, Machar a Nuer. According to the UN, the violence has displaced 1.3 million people within the country, including about 100,000 sheltering in often squalid conditions in UN bases. With agriculture disrupted, livelihoods lost and trade patterns wrecked, nearly four million face serious food insecurity. Another 450,000 have fled to neighbouring Sudan, Ethiopia, Kenya and Uganda. Those countries, as part of the IGAD regional grouping, have tried to broker an agreement between the warring parties. Seeking to address root causes of the conflict, IGAD as well as foreign donors also have pressed the two sides to sign up for far-reaching reforms as well as a power-sharing deal in a transitional government. The mediators have threatened “punitive” action against spoilers. But the feuding South Sudanese factions appear far from reaching agreement. 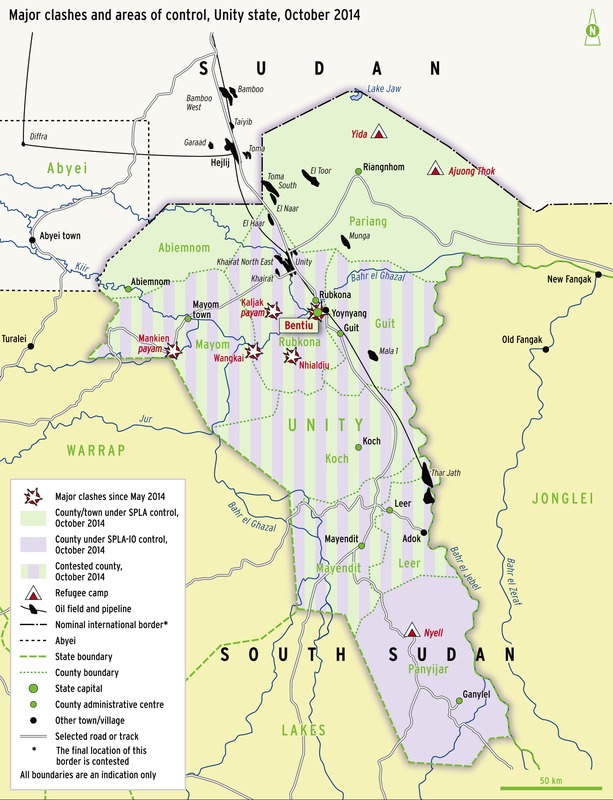 Major clashes and areas of control, Unity state, October 2014. 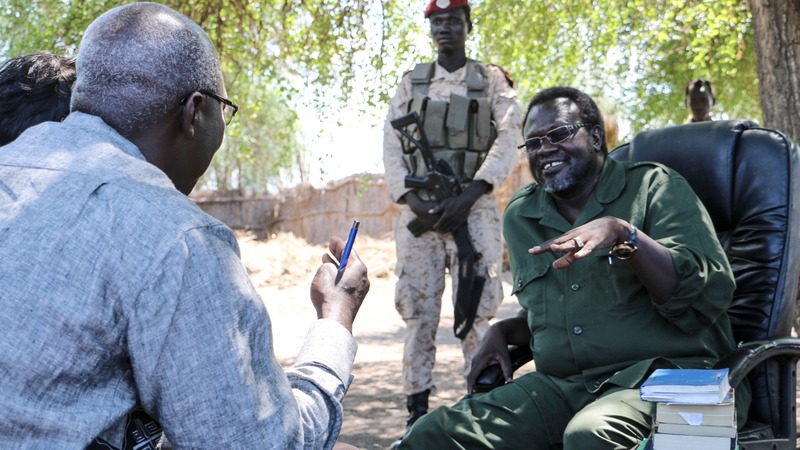 Machar last month refused to sign a detailed protocol mapping a way out of the conflict, even though it offered to create the position of prime minister for an opposition nominee. The protocol also included commitments designed to de-centralize power, rein in corruption and foster reconciliation. The talks have continued but suffered another blow last week, when government spokesman Michael Makuei Lueth demanded the removal of the Ethiopian chief mediator, accusing him of pursuing “regime change” at the behest of the USA, the UK and Norway. He reportedly also demanded that the process relocate to Kenya. The protagonists have warned of all-out war if the talks founder, fanning concern that while the politicians declare their commitment to making peace, commanders on both sides are preparing new military campaigns. Peter Biar Ajak, director of the Centre for Strategic Analyses and Research in Juba, said the failure of rebel forces to make any significant gains in recent months may have encouraged the government to pursue a military solution. In the dry season, government troops can make use of heavy weapons including tanks and armored vehicles that the rebels lack, and the government’s rejection of the Ethiopian mediator might be a delaying tactic, Ajak told IRIN. “If [the talks] are moved to Kenya, I don’t see the possibility of making substantial progress before the rainy season ends. And maybe this is where the government’s line of thinking is going: ‘If we can drag this out until the rainy season ends, then we can have a military victory,’” Ajak said. The absence of an agreement has fanned concern that the war could escalate into a crisis pitting Uganda against its regional rival Sudan. Ajak said a breakdown of the IGAD talks combined with a government offensive would also make it harder for the Ethiopian government to resist pressure from the Nuer-dominated authorities in its Gambella region, which borders South Sudan, to support the rebels. “If it becomes an issue of war, Machar will do anything, whatever possible, to make sure he doesn’t lose,” Ajak said. Analysts point to South Sudan’s brutal history as well as a lack of sustained diplomatic pressure to explain the readiness of its political elite to use violence in pursuit of power and wealth, with little apparent regard for the suffering of ordinary civilians. Accounts of the country’s independence from Sudan in 2011 tend to focus on the decades-long struggle of the South Sudanese against Khartoum, obscuring the fact that much of the bloodletting in the south had been between rival armed factions. While Kiir was able to re-incorporate most of those factions into the SPLA ahead of independence, the current crisis has seen the re-emergence of splits - and violent tactics - all too familiar to the South Sudanese. “It is going to be a combination of a quieter environment for the people of this country, plus the continuation of a large aid operation, that will help people get through the dry season. If either of those two are absent, disaster will occur.” – Toby Lanzer, Humanitarian Coordinator. Machar, for example, is remembered for an infamous 1991 attack on the town of Bor, in which his supporters massacred an estimated 20,000 people after he created a splinter group within the SPLA. This time, Bor was again among the first targets of opposition wrath, in apparent revenge for the killing of Nuer civilians in Juba. Academics describe governance in South Sudan as a “kleptocratic” system, where power is maintained through patronage paid for by raiding the state coffers and turning a blind eye to embezzlement. Despite billions of dollars in revenue from South Sudan’s oil bonanza, the system has broken down, at least temporarily. “Both are trying to capture territory and resources in order to strengthen their positions in terms of that bargaining process,” Fisher told IRIN. Ajak said South Sudanese culture as well as the fierce rivalry between Machar and Kiir also helped explain the potential for bloodshed. “For them it has become about power and also about disrespect. They feel like the other side has disrespected them. So it becomes a personal issue. And the problem for us in South Sudan is, when you personalize things like that, people would prefer to go to the extreme end than to even negotiate and compromise,” Ajak said. The US and European Union have imposed sanctions on a handful of commanders from both sides. Donald Booth, US special envoy to Sudan and South Sudan, said last week that Washington intends “to give those who need to negotiate the thought that the US is serious, that there are consequences if this continues”. But there are doubts that the international community, including regional powers jockeying for political and economic influence, will bring significant pressure to bear. IGAD has yet to follow through with its own threat of sanctions, even after the warring sides failed to meet a series of deadlines. IGAD has most recently urged the parties to reach an agreement by mid-October. “Targeted, biting sanctions and other focused pressures are the best hope for altering the calculations of the conflicting parties,” Enough Project Director John Prendergast said in a report released in September. Tariq Riebl, director of relief agency Oxfam in South Sudan, said the crisis in South Sudan risked being overshadowed by those in Syria, Iraq and Ukraine as well as the Ebola outbreak in West Africa, with knock-on effects for both diplomatic attention and funding. Meanwhile, rights groups are warning that arms worth millions of dollars have flooded into the country since the start of the hostilities. Media reports, citing shipping documents, said a consignment of more than 1,000 tons of small arms and light weapons bound for South Sudan from China was unloaded in the Kenyan port of Mombasa in June. Amnesty International said there were reports that both sides in South Sudan were using ammunition manufactured in China as recently as 2013. A group of over 20 South Sudanese and international development and rights organizations have called on IGAD and the UN to impose an arms embargo - so far in vain. “As long as these weapons are imported into South Sudan, they are likely to be used to commit further atrocities,” the group said in its appeal. A senior security official working for an international organization in Juba said it was reasonable to assume that, even while the politicians discussed peace in Ethiopia, commanders on both sides were preparing for a new military campaign. The official, who asked for anonymity because he is not authorized to speak publicly, said there were signs that both sides were recruiting youth, reinforcing their positions and re-arming in case of a return to hostilities. Flashpoints include Bentiu, the capital of the key oil-producing state of Unity, where troops from both sides are positioned close to the town. Tension in Bentiu was further heightened by the shooting down of a UN helicopter on 28 August, killing two crew members and threatening supply lines to 40,000 civilians living in squalid conditions at the UN base there. Last week, both sides claimed gains in fresh fighting in other parts of Upper Nile, and that they had inflicted scores of casualties on opposing troops. “As it stands militarily, the only thing currently preventing a return to the widespread violence witnessed in the early months of the war is the rainy season,” the EIU wrote in a September assessment. The humanitarian consequences of turning back to arms could be grave. In the initial spasm of violence, many farmers across the north and east lost their cattle and were unable to plant their fields, raising fears that millions of civilians could fall victim to famine and disease. In response, relief agencies have marshalled a massive humanitarian operation that has helped avert mass starvation. However, experts have consistently indicated that the risk of famine will be most acute in the first half of 2015, when the meagre harvest from the disrupted planting season runs out. A September report by government agencies and food security experts said that, while good conditions during the current growing season had eased food insecurity since May, the situation is much worse than in a typical year. They forecast that some 1.5 million people will face “crisis” or “emergency” levels of food insecurity through December, including one-third of the population of the worst-affected states of Upper Nile, Jonglei and Unity. “Crisis” and “emergency” represent levels three and four on the widely-used Integrated Food Security Phase Categorization (IPC) scale. Level five is “famine”. “These populations have made it through conflict, displacement, and a harsh lean season in 2014 by relying on coping mechanisms, including traditional kinship sharing and distress asset depletion. As a result, their resilience into 2015 is expected to be very weak, particularly if new shocks occur,” the experts said in the IPC report. Lanzer, the UN humanitarian coordinator, said that in some counties farmers had begun gathering in crops prematurely in order to meet the urgent needs of their families, pushing down overall yields. The Famine Early Warning System Networks, a monitoring organization funded by the US government, predicted that flooding in Duk County, part of the violence-afflicted Jonglei State, would damage “already limited crop areas. Field reports suggest that harvests may only last for two months,” it said in a 15 September report. Lanzer said relief organizations intended to use the dry season to repair and upgrade crucial roads, airstrips and bridges so that they can pre-position supplies and ensure access to remote corners of the worst-affected areas once the rains resume next year. With no resolution to the conflict in sight, the UN has also had to accept that around 100,000 civilians crammed into its peacekeeping bases are unlikely to return home in the near future. Following heavy rains, living conditions in some of the camps have become desperate. Families have been living in knee-deep mud contaminated with human waste from collapsed latrines. Some camps have faced shortages of clean water, and there is concern about rising violence in and around the camps, especially against women. Lanzer said the UN would use the dry season to upgrade the most inhospitable camps, in the northern towns of Bentiu and Malakal. Dutch engineers were providing advice on improving drainage in Bentiu, he said. He said the UN would neither force nor encourage people to return home against their will. But he said the world body would help people “make contact with other communities and with members of the local authorities” in order to encourage reconciliation and trust-building.